Why do we get varicose veins? Two sets of veins return blood from the legs to the heart: The deep veins, or femoral system, which does about 90 percent of the work, and the superficial veins, or saphenous system, which begins just above the ankle bone and courses up the inner part of the leg to meet the femoral vein in the groin. When the vein’s wall (“venous wall”) or valves in the leg veins don’t function properly, it becomes harder for blood to move back to the heart. This condition, called chronic venous insufficiency, or CVI, causes blood to pool in the veins. Varicose veins -- the twisted, bulging veins close to the skin’s surface -- are signs of a milder type of venous disease called venous insufficiency syndrome. Spider veins (telangiectasia), web-like clusters of dilated veins usually red or blue that often appear on the face and legs, are sometimes found together with varicose veins. Varicose veins and spider veins are often uncomfortable and cosmetically objectionable, yet still manageable. They are also common in people over 50 years old. Muscle cramps, swelling, throbbing and burning in your lower legs. Increased pain after sitting/standing for extended period. When to contact your doctor: Any hardening of the vein, inflammation, skin ulcers near your ankle could be a sign of vascular disease. What keeps blood moving from the legs to the heart? The muscle-massaging action of walking. One-way valves keep the blood from falling back down the vein. For a variety of reasons, including heredity, pregnancy, previous leg surgery or injury and obesity, these valves can stop functioning and the blood falls back down the veins. 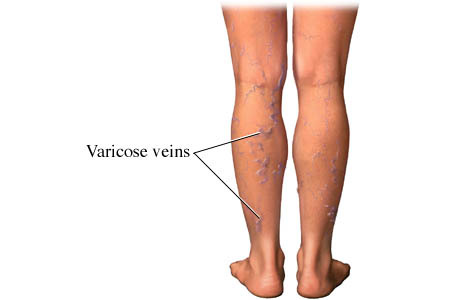 This is called CVI (chronic venous insufficiency), a condition that usually, but not always, includes varicose veins. If not treated, CVI can cause skin-color changes, hemorrhage from the veins and skin breakdown (venous ulceration). Treatment depends on the severity of the disease, the size of the veins and whether reflux is present. Of greater concern are the people with active venous ulcers, associated with a reduced quality of life (particularly in relation to pain), physical function and mobility. Compression stockings work well for mild leg heaviness, ankle swelling and small visible varicose veins. They come in a variety of lengths, colors and fabrics. Most people report significant symptomatic relief. Larger veins, and spider veins, can be managed safely and easily by either lasers or injection sclerotherapy. The latter involves the injection of a dilute detergent foam directly into the veins, causing them to shrink and eventually be absorbed by the body. Cosmetic lasers are highly successful in erasing unsightly leg or facial veins. For larger, more bulging veins, surgery is often recommended. Microphlebectomy, or tiny incisions over each vein that allows their surgical removal, is an option with minimum post-operative discomfort or downtime. The standard method, for centuries, to remove the saphenous vein was “stripping” it out bluntly from the ankle to the groin. But this procedure can be accompanied by post-operative swelling, bruising, pain and, in more than 50 percent of cases, reformation of parts of the vein. Fortunately, in most cases, vein stripping has been replaced with a procedure called “venous ablation,” where the vein is “shut down” by the heat emitted by a catheter that is inserted into the vein. The heat is either from a laser or radio-frequency energy. Both are effective, although laser ablation has a somewhat higher incidence of pain and post-procedural bruising.